Hey, Performance Golfers, Matt Walter here at the Vanderbilt Legends Club. 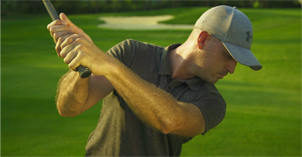 Today, I’m going to show you how to pure your wedge around the greens by utilizing the bounce. Let’s start off with a few caveats. What is the bounce, and how do we utilize it? The bounce is the bottom of your wedge. It’s where the club interacts with the turf. It will effectively do exactly what it’s called and bounce through the ground and glide. We want to make sure, when we’re hitting these pitch shots, we’re utilizing this part of the club and not the leading edge. The leading edge will almost always dig into the ground unless you try and manipulate it, and that will affect your ability to glide through the turf, produce spin, and interfere with the consistency in which the ball takes off from the face. So, we have to be able to use our weapons effectively when it comes to using a wedge around the green. One of the things I like my players to think about is, when we swing our wedges, we don’t want a lot of twisting and rotation in the club face. It’s actually better to feel like the club face stays pretty neutral as it goes around us and doesn’t have a lot of opening and closing, because once it has a lot of opening and closing, the club face is obviously going to be in a closing manner, but more than likely, you’re going to toe it down, put the leading edge in, and that’s going to dig. 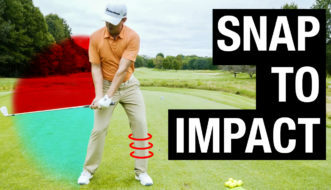 You’re going to take some pellets on your pitch shots, and it’s not going to let you spin the ball as much, and it’s going to create a little bit of rough interference with the turf, and control of the club face becomes a lot more difficult because it’s going to open and close it a little bit if the toe hits in first. But, what I like to have my players think about is, if I swing the club, trying not to twist it in my hands, but just swing it around my body, the toe of the club will point way more up or behind me than it would if I was trying to twist it. So, that would be a little bit more shut if I’m trying to keep the club face more square. So, we want to let it kind of open up, work around our body, and then we want it to finish more around our body as we go left to our finish line, and we’re going to keep the club face pointed back at us, so we keep the bounce to the ground. A great way to think about it is, if you had a mirror attached to the club face, you’re looking at the mirror at address, you should be looking at the mirror in your backswing, you’re back at the mirror at impact, and you’re at the mirror in your follow-through. 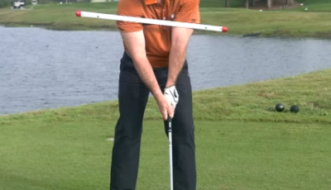 So, all three of those positions will allow you to control the club face. So, where I often see most players is, on their through-swing, they have that club face released where it’s toe-down. 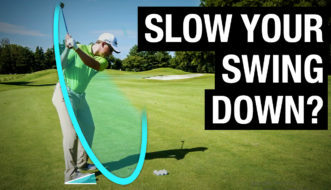 Great if you’re hitting a full-swing shot. Not so great if you’re trying to hit a pitch shot. We want that club face looking more back at us and not twisted over. So, it’s a very big of a sensation that you’re getting the club face to work around your body and there’s not a lot of twisting in the shaft. We’re going to let the club face roll open a little bit in the backswing, and then we’re going to try and swing it around our body, keeping that face pointed to the sky. And so, what that will let us do, it lets us glide through the turf, where there’s barely any divot taken, and it lets us produce a lot of spin. If I were to shut the leading edge down in the follow-through, you can see where it would take much more of a divot, and the ball hit and rolled a lot further than what I would intend. So, we want to make sure the club face feels like it’s staying open as we go through the shot. You want to feel a thump, and you can hear that audible thump on the ground as you hit. Now, when you make your practice swings, you can hear that thump, and you can also see how long that club is interacting with the turf. So, I can put down a couple of tees around my golf ball, and what I did was, it’s approximately twice the width of my club head, and what I want to do is, I want my club to interact with the turf somewhere in that window. So, if my golf ball sits in the front third of the two tees, so the third closest to my target, I have two-thirds behind it. If I interact with the turf somewhere in that window, I’ll hit a good pitch shot. And you’re saying, “Well, coach, I thought we had to hit ball first and not grass first.” That’s not necessarily true because you can interact with the turf a little bit before the ball and still maintain a good pitch shot mechanic. And that’s actually why we utilize the bounce, is that so we can interact with some turf just a fraction before the ball, and skid underneath it, and produce a lot of spin up the face. So, again, I made some practice swings, working on how I have my club impact between the two tees. I’m working on feeling that club head go around my body with the club face still looking at me, and then we’re going to hit a nice, soft little pitch shot. So, if all goes well, my club interacted here at the back tee, went through, caught the golf ball. So, again, I interacted with some turf prior to the golf ball, and I still got away with a good pitch shot. And so, that’s what you want to have. If you’re playing for a $100 Nassau with your boys, you want to make sure that club can interact with the turf, and you’re not going to chunk it and hit the divot further than your golf ball. And as long as you keep that interaction the same, you’ll have a great product when it comes to hitting pure wedges around the green.